Do you want to bring natural flair to your home or garden? Highly resilient and aesthetically beautiful, slate is a classic natural stone that’s always in fashion. Brazilian slate in particular offers many different designs and colours and could be the ideal way to enhance your home in 2019. 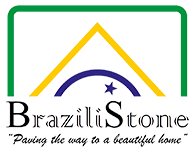 If you want to achieve a striking look in your home or garden, Brazilistone can help you do it. Our slate paving specialists offer a wide range of products to choose from, including slate slabs for use in your garden. As you can see from our gallery, our slate tiles and slabs can bring a sophisticated appearance to any space. Whether used on a wall or as flooring, Brazilian slate offer a smooth riven surface which is simply irresistible. It looks fabulous whether on a patio, surrounding a swimming pool or the foundation for your bathroom. Slate slabs are particularly popular with swimming pool owners, because this material is naturally slip-resistant and it offers unbeatable design flair. Our large slate slabs are ideal for all sorts of projects, including hearths and flagstones in your garden. 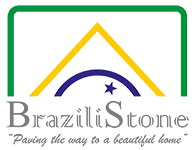 For more information, simply get in touch with one of our specialists today.